Time flies, our 2 little girls already 4 and 2!!! 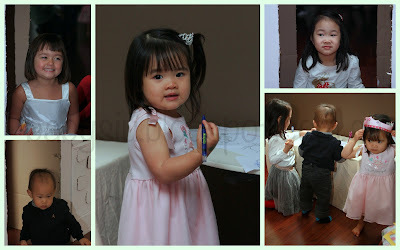 Since the past few years mommy hasn't put much effort to do a nice birthday party for the girls (1st year busy with work/business, 2nd year just delivered, 3rd year bad morning sickness), thus this year mummy decided to set aside 2 weeks to prepare a nice birthday bash for her 2 princesses. This will be also be the last big birthday bash for them until they are much older. Esrene wanted a princess party. She even choose her cake design!! (Kids nowsaday are blessed and spoilt). 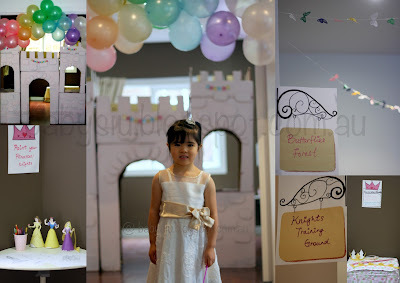 Mommy came across a very nice princess party idea online while searching for idea, so decided to use the same concept for their princesses party. Birthday invitation card with map of the party printed. 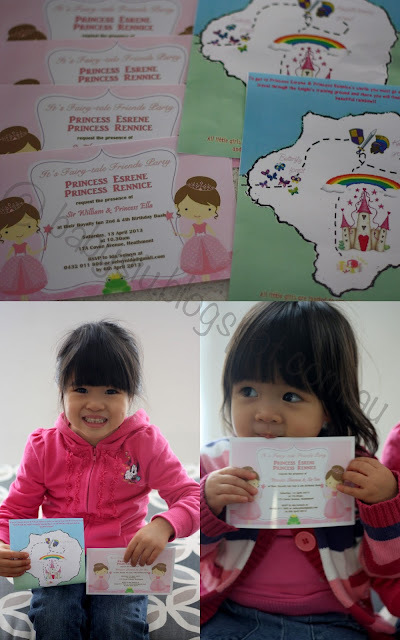 The girls were so excited to see their invitation card and helped to seal in the envelope for their friends. Inside the castle there are activities for them to colour the princesses/knight and make the crown too! Thanks to Uncle Tim & Auntie Audrey for the boxes from their cargo, mommy managed to made use of them to make a pink colour with the left over paint for the party. And the sugar heaven for the kids.....the dessert table! 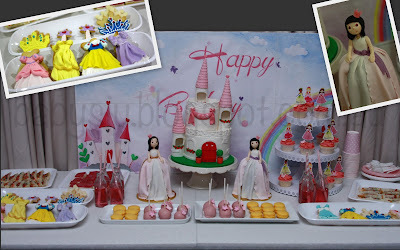 Esrene wanted a castle cake and decided that her "mei mei" should have the princess doll cake. Mummy thought it will be weird to only have one dolly cake for 2 princesses' party so at the end 2 mini dolly cakes was made besides the castle cake! The girls had a blast on that day. 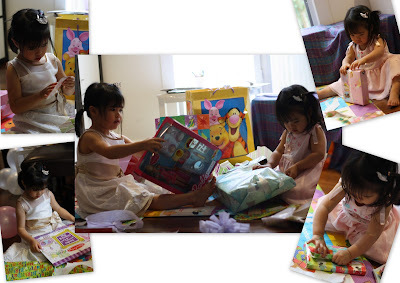 Esrene couldn't wait to open the presents right after the guests left. As usual they were very excited to receive the gifts but it last for few days before they started to throw the toys away or ignore them. Well kids! Mummy daddy hoped that you girls enjoy the party which mummy spent time on. May God continue to shine upon you everyday and His hands are on both of you in everything you endeavor. p.s. Grandpa, grandmas, aunties and uncles please don't buy anymore toys, books and puzzles for them. They have more than enough and started to destroy the toys, throw them everywhere, not knowing how to appreciate anymore. Please help them to grow to appreciate and be content with just a little.